The high viscosity, neutral pH tooth whitening gels ensure the greatest patient comfort for use in custom made trays. The unique blend of soothers, conditioners and high water content assist in reducing sensitivity. The formation of plaque and tooth decay is significantly reduced. The incorporation of special additives minimises plaque formation and enhances remineralisation to further reduce sensitivity. The high water content of the gel reduces dehydration of the enamel and decreases patient sensitivity. This reduces the tacky feeling and drying effect of the gel in turn reducing sensitivity further. The high viscosity gel ensures it can be easily and securely placed into the tray and remains in the tray for the entire procedure. The pleasantly flavoured spearmint gel is both fresh and long lasting. 1% hydrogen peroxide approximately equals 3% carbamide peroxide. Pola Day CP can be given to the patient to take home and apply to their trays themselves. From just 15 minutes, once or twice per day, patients will see changes immediately. Apply Pola Day CP to the patient’s trays the same way a take home system is applied. They can wear it for 30 minutes in the waiting room before they go home. Most patients see their teeth change 3 or 4 shades. After seeing the results from this quick session, patients begin to see just how effective tooth whitening can be, before they start their at home treatment. >A patient requesting whiter teeth wants to see a result when they walk out of the dental office. Promoting a take home system, such as Pola Day or Pola Night, means they carry out the procedure themselves at home. 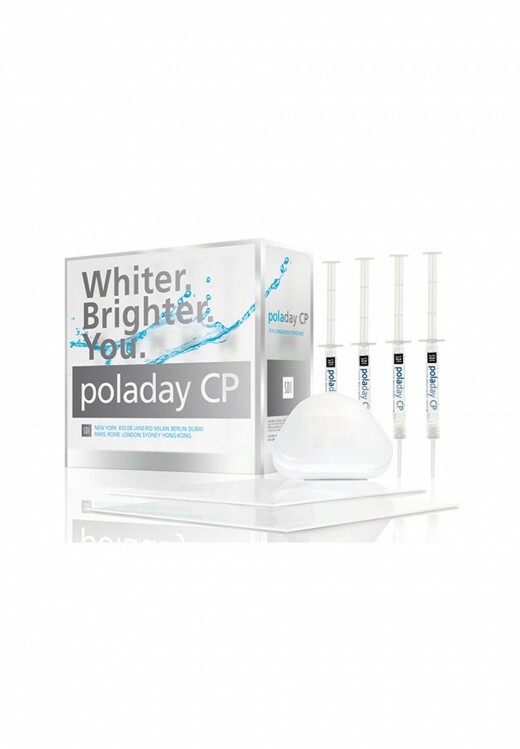 Get them excited about bleaching by giving them a “jump start” with Pola Day CP.